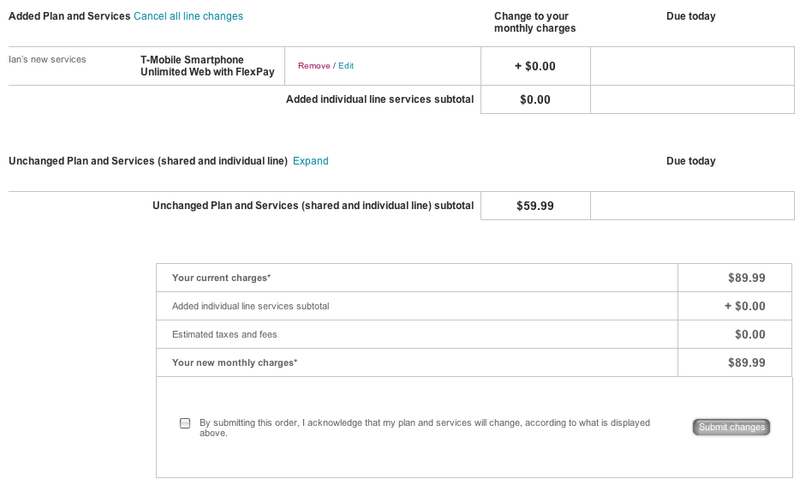 For reasons that aren't material to this rant, I'm trying to get a T-Mobile SIM card set up with T-Mobile's ridiculously named "Even More Plus 500 Talk + Text + Web" plan. At this point I have a SIM card, and after much pain and suffering in phone conversations and online chat support, I have an account that is fully paid up. 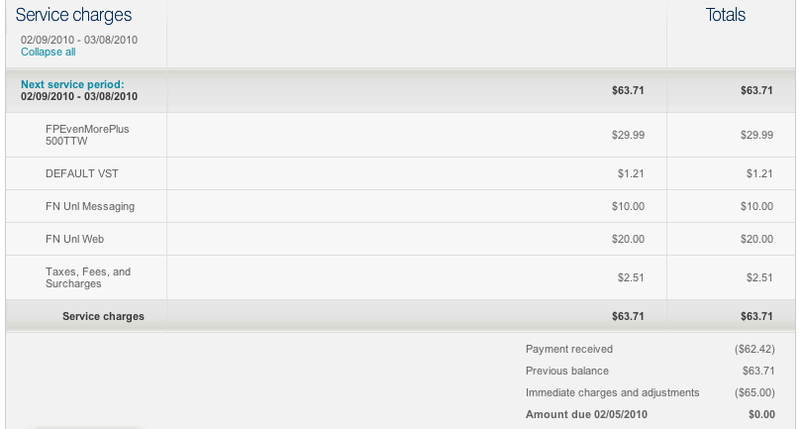 Ok it says I owe $62.42 by 1/19/2010 (today) for service from 2/9/2010 - 3/8/2010 (next month). 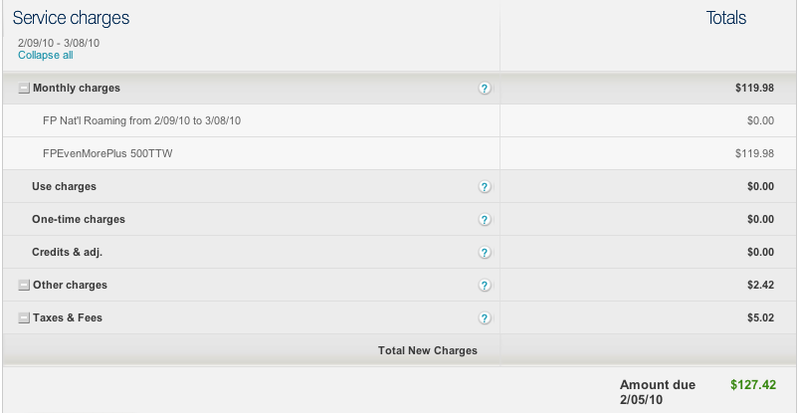 But it also says that my monthly charges for my previous bill are $127.42 due on 3/9/2010 (two months from now). Oh look, the details are below the fold. This says the next service period is $63.71, that they've received $62.42, that the previous balance was $63.71, and that they "adjusted" my account by $65.00 (the result of my calling billing support because they hadn't applied the $63.71 they actually charged me to my account), and apparently that all adds up to me owing $0.00... by 02/05/2010. Clearly maths is not their strong point. Also not their strong point: being consistent about how they mark up dates. Or how they decide what dates are important. Oh and... also not their strong point: matching reality. So far they've only actually charged me $63.71, once, though I have in fact tried to pay more than once (earlier today I also tried to pay the $62.42 that some of these pages claim I owe, though my bank has yet to see that charge). Still, the $127.42 is a bit confusing. Let's see what the "View Bill" button under that number brings up. Whaaaa!? FPEvenMorePlus 500TTW $119.98? What on earth is that? "Amount due 2/05/10: $127.42"? That completely contradicts the previous page! How much do I owe on that day, $0, or $127.42?? They say the way to work out how much you owe is to dial #225# from the phone, so let's try that... Ok, that says $0. I guess the phone would know best. Added plan and services... $0, yup. 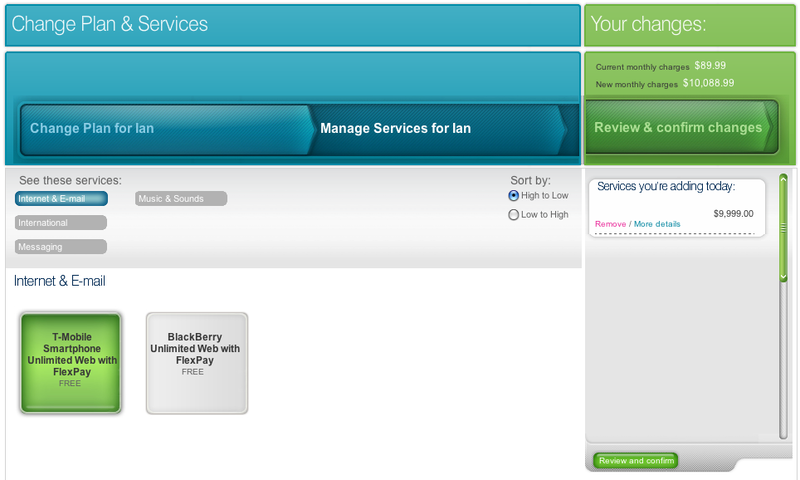 Unchanged plan and services... $59.99. Yup. So, the grand total is... $89.99. Wait, wait, hold on, let me recheck the maths here... $0... plus $59.99... carry the one... What?? TEN THOUSAND AND EIGHTY EIGHT DOLLARS AND NINETY NINE CENTS?! I give up. I'll try calling them tomorrow.